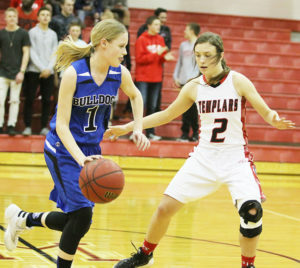 MANTI—The Manti Lady Templars played off the momentum of a big overtime win on Tuesday, Jan. 31 and battled the Gunnison Lady Bulldogs to a 47-40 victory. Playing in front of a packed gym and an enthusiastic crowd, the two teams battled from the opening tip-off to the final buzzer with Manti earning the seven-point advantage. With less than three minutes left to play, the Bulldogs held a tenuous 39-36 lead when Manti’s Ashton Wood hit a pivotal three-pointer to tie the game at 39. Manti outscored the Bulldogs 10-1 in the final minutes of the game to take the win. In the final eight minutes of the game, seven different Templars scored. Paige King led the Bulldogs with 10 points. Jaida King added eight, six from three-point range. Katelyn Anderson had seven points, Tayler Brackett had six, Sheridan Sorensen was perfect from the field, and three of four from the line for five points, Kaitlyn Wegener and Taryn Thompson had two each. Playing in her final home appearance, senior Leah Howe had a career game for the Templars. She finished with 18 points, 13 rebounds, four assists and three steals to lead all scorers. Auri Squire had nine points, six from behind the arc. She also had three rebounds. Wood added seven points and had three assists. Amie Squire had four points and five rebounds. Kjerstin Birch had four points and two boards. Keslee Cox and LaRiah Rosser had two each, and Kallie Young hit a free throw. The Templars are hot on the heels of Gunnison in Region 15 standings. The Lady Bulldogs have one more game at home against North Sevier tomorrow. The Wolves are having a great year and will be a tough assignment for Gunnison. Should North Sevier win, Gunnison will finish the regular season at 3-7. Meanwhile, Manti has three more games, all on the road. They traveled to North Sevier on Tuesday. Results of that game were not available at press time. Tomorrow will see Manti in Blanding to take on a tough San Juan team, followed by a visit to Moab to play Grand. 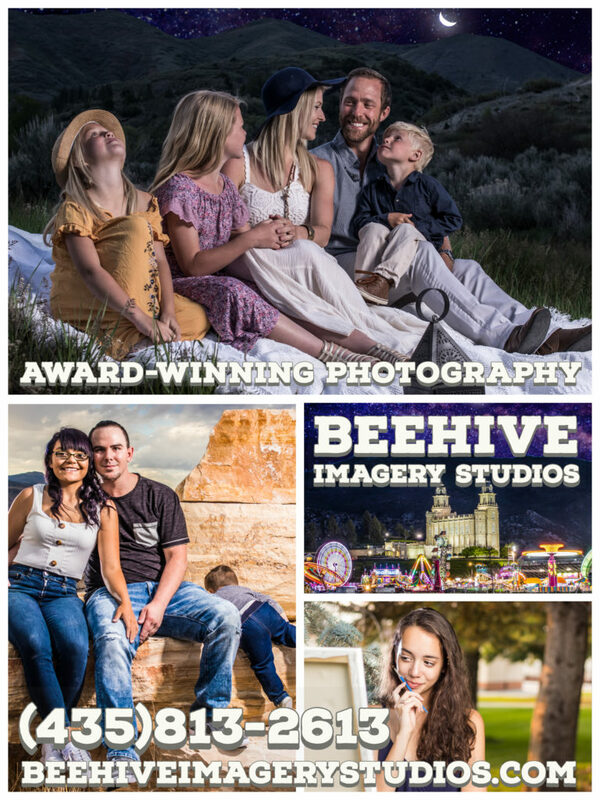 If Manti wins any one of these three games, they will also finish the season with a 3-7 record, forcing a play-in game with Gunnison with the winner of that game advancing to post season play. MANTI—All year long, the Manti Lady Templars have played hard through diversity without reaping the benefits of winning games. Last week that tenacity paid off as the Templars won two Region 15 games and earned the possibility of advancing to post-season play. 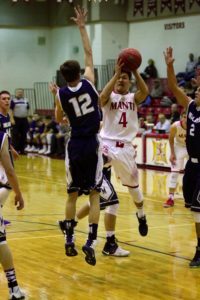 On Tuesday, Jan. 31, Manti hosted Grand County and battled to tie it up at the end of regulation and go on to win 51-48 in overtime. Thursday, Feb. 2 saw the Gunnison Lady Bulldogs come to town. Manti won that game (see related story) 47-40. Against Grand, the Templars trailed by five at the half and by three going into the fourth quarter. Hard-nosed defense by Keslee Cox, Ashton Wood and Kallie Young forced six fourth-quarter turnovers by the Red Devils, allowing Manti to close the gap. With 1:27 left to play, Manti took a one-point lead on an Amie Squire put-back bucket 42-41. Grand responded by hitting four free throws in a row to regain the lead at 45-42 with 12 seconds left to play. Manti went to Auri Squire, who hit four of six three-point attempts in the game, for the tying shot from the left corner. Squire was fouled on the shot and went to the line to shoot three. Manti has struggled all year from the charity stripe, but Squire has ice water in her veins as she swished all three shots to tie the game and force overtime. The extra minutes started out ragged as Keslee Cox got a steal on the first possession by Grand. Unfortunately, the Templars turned it right back over. The Templars settled down, and Auri Squire hit her fourth three of the game. An offensive rebound and put-back by Leah Howe, followed by a free throw, gave Manti the three-point win. The Templars showed good offensive patience, working the ball into the post where Howe accounted for a team-high 17 points. She was one rebound away from a double-double with nine boards. She also had three assists. Auri Squire finished the game with 14 points and two assists. Amie Squire had six points and three assists. Cox had four points, seven rebounds and seven steals. Wood scored two points, had four assists and three steals. Young had two points and two steals. Cassidie Larsen, Kjerstin Birch and Tyra Hermansen all hit a free throw. Birch also had five boards. The victory over Grand, along with the win over Gunnison, places the Templars in a position to advance to post season play. MOAB—Last week was a tough one for the Manti boy’s basketball team. On Wednesday, Feb.1, the Templars traveled to Moab to take on Grand. The Red Devils had a big third quarter to pull ahead and hold on for the 62-55 win. Friday, Feb. 3 saw the Templars in Gunnison (see related story) where they struggled from the free throw line in their loss to Gunnison by an almost identical score of 61-55. The game against Grand was a brutally physical one in which the Templars held a 32-30 lead at the half. Grand took control of the third quarter to go ahead 51-42 going into the final period. Manti shaved two points off that lead but still came up seven short. Matt Nelson led the Templars with 14 points, Tanner Rasmussen had 13, Dylan Wathen added eight, and Riley Curtis had six on a pair of threes. Mac Stevens also had six points. Corbin Linam, Kade Nicholes, Kole Brailsford and Sam Benson had two each. The two losses have put Manti in a precarious playoff position. They could clinch a playoff berth, or tie with Gunnison for the final playoff spot. The Bulldogs only have one game left in their season, a road game at North Sevier tomorrow. The Wolves have yet to win a region game, and the last time these two teams met, the Bulldogs won it easily, 52-42. Manti still has two league games on their schedule. The Templars hosted North Sevier on yesterday. Results of that game were not available at press time. Manti beat the Wolves in Salina, 85-59. Manti will then host San Juan tomorrow in the final game of the regular season. The Broncos had been holding a solid second place in region play and were ranked number two in the state last week. On Friday, Grand shocked the Broncos in Blanding using a huge first quarter to upset San Juan, 73-68. If Manti can beat both North Sevier and San Juan, they will claim the number four seed in Region 15 and advance to the play-in game in Orem on Feb. 18. Their opponent would be the top seed from Region 14, most likely Layton Christian or Waterford. If Manti wins one of their final two games, they will likely finish the regular season in a tie with Gunnison, forcing a play-in game to determine which of these two teams would advance to the game in Orem. 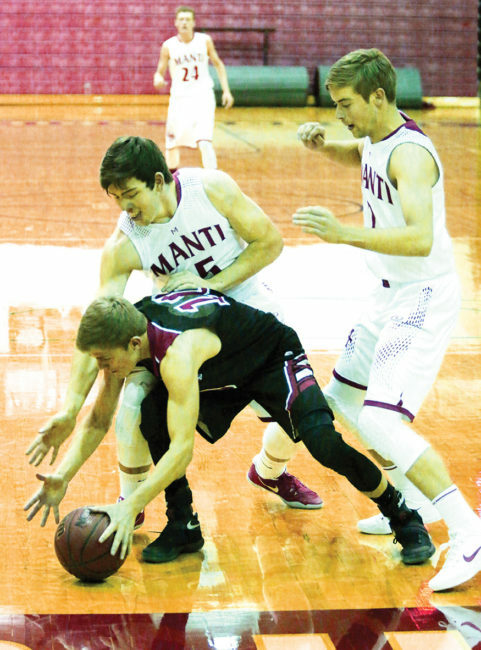 MANTI—Friday, Jan. 27 saw the top-ranked team in 2A basketball visit the Templar home floor and, after a harrowing clash, came away with a 68-60 win against Manti. The Emery Spartans controlled the first half of play but saw their 16 point halftime lead dwindle to as few as three in the final minutes of the game. Still, Manti was unable to close the gap and came up short by eight in the end. Matt Nelson opened the second half with a pair of layups and then joined Riley Curtis in lighting things up from three-point range. The pair combined for 15 third period points as the Templars outscored the Spartans 25-17. Having cut the Emery lead to eight, outside shooting forced the Spartans to play honest defense and opened things up in the paint for Corbin Linam. With just over a minute left in the game, Mac Stevens hit a bucket to cut the Emery lead to three at 63-60. Unfortunately, they would be the last Templar points, and the Spartans hit their free throws to go on for the eight-point win. Nelson Led the Templars with 16 points, 12 from three-point range. Curtis had all 12 of his points from behind the arc. Dylan Wathen had nine, as did Linam. Stevens added eight, Tanner Rasmussen had four and Sam Benson had two. This week the Templars will be on the road. First was yesterday at Grand. Results of the game were not available at press time. The Templars lost to Grand by six in Manti on Jan. 11. A win in Moab could be instrumental in the Templars overtaking Grand in the region standings. Manti will then travel to Gunnison on Friday. Earlier this year Manti beat the Bulldogs by 21 points. CASTLE DALE—Although the game was no longer in question when the Manti girls basketball team went on a run at Emery on Thursday, Jan. 26, the Lady Templars had a 23 point fourth quarter in their 69-34 loss to the Spartans. Leading 37-2 at the half, the 15-1 Spartans went to their bench early, but the Templars exhibited their trademark tenacity and played their hearts out in the final eight minutes of the game. “They played much better in the second half,” said coach Roger Watson. Ashton Wood got a steal and a layup to open the final quarter. Howe got a nice assist from Keslee Cox for the second score, and the Templars were on a roll. In the eight-minute span, Leah Howe got good passes to set up her spin move in the paint. She had nine of her team-high ten points in the fourth. Auri Squire had four of her six points. Howe was one rebound away from a double-double with 10 points and nine boards. Cox had six points and eight rebounds. Auri Squire also had six points. Amie Squire had five points, Amber Naylor joined wood and LaRiah Rosser with two each, and Kjerstin Birch hit a free throw. This week, Manti hosted Grand on Tuesday. Game results were not available at press time, but if the Templars kept up the momentum of their past three games, they had a good chance of earning their first region win of the season against the Red Devils. Today will see Manti traveling to Gunnison to play the Lady Bulldogs. Earlier this year, Manti lost to Gunnison by nine in a close game played on Templar turf. MANTI—The Manti girls basketball team had perhaps two of their best team efforts last week, but unfortunately, the team was three key players short and taking on two of the best teams in the state. 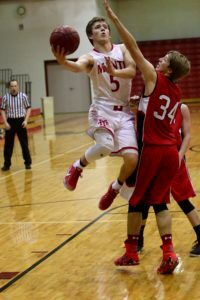 On Tuesday, Jan. 17 Manti came up short 66-22 against North Sevier and then on Friday, Jan. 20, lost to San Juan 51-20. Coach Roger Watson and his assistants were also pleased with the effort of their players. Fans in attendance last week saw an improved level of play by the Lady Templars. They were more confident and aggressive on offense, more patient running plays and played better defense. 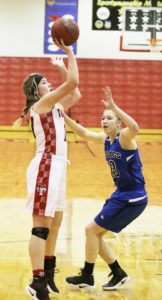 In the North Sevier game, the Templars went to Leah Howe in the paint where she scored a team-high 11 points. The Wolves had a hard time stopping her, so they sent her to the free throw line 11 times, where she got seven of her points. North Sevier launched 21 shots from three-point range, netting 15 points. Manti was one of four from behind the arc. Howe had six rebounds to go along with her 11 points, Ashton Wood had four points, Auri Squire hit a three and had four boards. Kjerstin Birch had two points and four rebounds. Tyra Hermansen had two points. Kallie Young had five rebounds; Amie Squire and Keslee Cox had three each. Against San Juan, it was a defensive struggle for the first four minutes of the game until Auri Squire hit the first bucket to give Manti their only lead of the game. It was a very physical game with many Templar fans wondering what it would take for Manti to earn a trip to the free throw line while the Broncos got 21 attempts from the charity stripe. Manti had 28 rebounds in the game compared to 31 for San Juan. The Lady Templars also forced 21 Bronco turnovers. Auri Squire looked more comfortable after being moved from point guard to shooting guard. She led Manti with eight points and four rebounds. Wood had four points, three boards and four steals. Amie Squire had three points and four rebounds. Cox had two points and five rebounds. LaRiah Rosser had two points, and Birch hit a free throw and had five rebounds. Young had four rebounds and two steals. Howe missed the San Juan game due to a neck injury from when she dove for a loose ball in the North Sevier game. She is hopeful for this week’s game against Emery. Jamie Bawden is out for the year. She had just been cleared to return to the court when she ruptured her Achilles tendon in a freak accident away from practice. Avalin Cook is also out for the season with torn ligaments in her ankle. Wood is playing with a heavily braced knee to support a dislocated kneecap and will likely undergo surgery after the season. Manti will travel to Emery today. The Spartans are 14-1 on the year and ranked second in the state behind North Summit, the only team to beat them. Emery is 5-0 in region play. 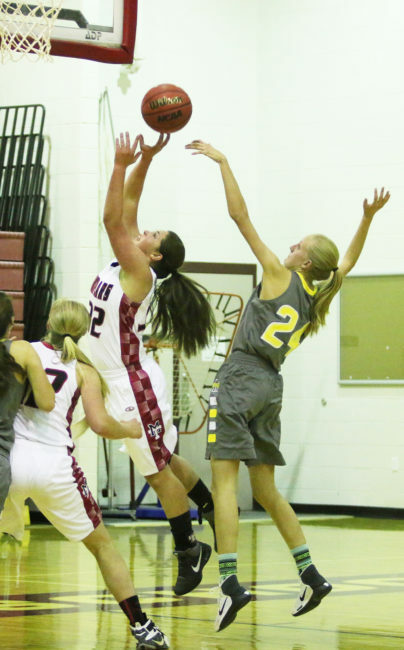 MANTI—The Manti High girls varsity basketball team had a tough week, losing to Juab 45-17, Emery 62-16 and Kanab 53-22. Although frustrated with the rash of injuries this year, the Templar coaching staff are still pleased with the efforts of the players. Despite their winless record, the Lady Templars continue to play hard and the sparse, but enthusiastic fans continue to celebrate every small victory with their team. 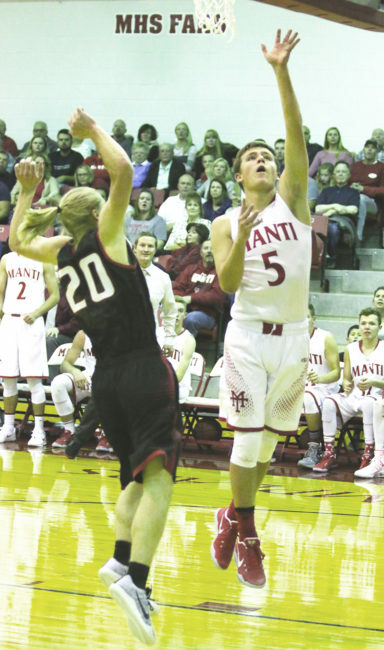 On Thursday, Jan. 3, Manti hosted Juab and trailed 29-13 at the half on the way to the 28-point loss. Avalin Cook led the team with six points and two steals. Leah Howe had five points and five boards in the first half but did not play in the second. Kjerstin Birch had two points and seven rebounds. Amie Squire had two points and five rebounds, while Keslee Cox had two points. 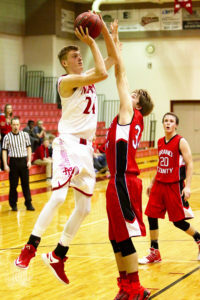 The game on Thursday, Jan. 5 against Emery was another tough loss for the Templars. The Spartans used a big first quarter to outscore Manti 24-4 and then repeated the feat in the third 23-1. Aston Wood led Manti with four points. Tyra Hermansen joined Cook, Cox, Birch and Howe with two each. Kallie Young hit a free throw. Birch had eight rebounds in the game, Cox had five, and Cook and Young had four each. Young and Howe had three steals each. On Saturday, Jan. 7, the Kanab Cowboys were in town and got the early 15-0 lead. Some defensive adjustments and more confident offensive play allowed the Templars to hold Kanab scoreless in the second while scoring four to cut the lead to 11 at the half. The third quarter saw the Cowboys blister the nets with 92 percent shooting from the field to score 24 points to Manti’s eight. Kanab then went on for the win. Auri Squire hit a pair of threes on her way to eight points; she also had three rebounds and three steals. Wood had seven points, five rebounds and three steals. Howe added five points, had seven rebounds and three steals. Young had two points while playing great defense on Kanab’s hot shooting Sidney McDonald. She also had two assists and two steals. Birch had five boards and Amie Squire had two. The Lady Templars will have one game this week, a region matchup at Gunnison today (score unavailable). The Lady Bulldogs are 4-9 on the year. DUCHESNE—Just when the Manti girls basketball team saw starting point guard Avalin Cook return to the lineup after recovering from an ankle injury, the team’s leading scorer, Jamie Bawden was benched with a similar injury. Although both players took the floor in the Templar loss to a very good South Sevier team on Dec. 8, the Rams dominated that game for the 63-31 win. Two days later, Bawden’s absence against Duchesne might have been the difference when Manti lost to the Eagles, 34-20. Against the Rams, the Lady Templars fell behind early and could never close the gap. Manti trailed 33-19 at the half and although they never quit, couldn’t stay with South Sevier. Leah Howe had arguably the best game of her varsity career with a double-double. She had 12 points and 16 rebounds. Bawden scored seven points with four boards. Cook saw limited playing time and had four points and five rebounds. Auri Squire hit a three pointed, Annie Hammer and Kjerstin Birch had two points each and Amie Squire hit a free throw to go along with four rebounds. At Duchesne, the Lady Templars got off to a slow start and trailed 18-2 at halftime. The second half was a better showing with Manti outscoring the Eagles, 18-16. Cook led the Templar scoring with eight points. She also had two rebounds and two assists. Kallie Young joined Birch with five points each. Young had five steals while Birch pulled down five rebounds. Amie Squire had two points and five rebounds. Things won’t get any easier for the Lady Templars this week. 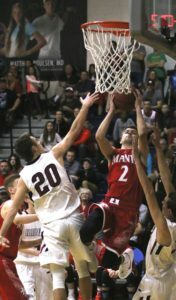 They will be traveling to Richfield on tomorrow for the 3A-2A Preview at the Sevier Valley Center, where they will take on Hurricane at 1 p.m. Saturday will pit the Templars against Beaver at 1:30 p.m.
MANTI—The Manti Lady Templar basketball team earned some valuable varsity experience last week. After a close 49-44 loss to Maeser Prep on Tuesday, Nov, 29, Manti won a 38-20 defensive battle over American Leadership Academy (ALA) on Dec. 1 before a tough 66-26 road loss at North Sanpete the next day. Against Maeser, turnovers hurt the Templars early. By the half, Manti had turned the ball over 18 times, yielding eight of the Lionesses’ 24 points. At the intermission, the Lady Templars trailed 24-16. Templar fans watched a faster paced, up-tempo game in the second half as Manti chiseled away at the Maeser lead. With two minutes left to play, Jamie Bawden got a layup off a Leah Howe steal to pull within three points. The final seconds of the game came down to free throws. Maeser went six of 10 while the Templars were two of six from the line. Manti continued to rebound well, pulling down an impressive 43 boards compared to 27 by the Lionesses. The Templars took better care of the ball in the second half, only turning it over seven times in the final 16 minutes. Howe led the Templars with 15 points and 12 rebounds. Bawden had 12 points and six boards, Auri Squire had seven points, and Amie Squire and Kjerstin Birch had five each. In a total team effort, the Lady Templars took control of the game against ALA. There were 10 different Lady Templars who got into the scoring column, with Bawden netting a game-high 15 points. Howe added seven points and grabbed 11 rebounds. Auri Squire continued to do a good job filling in for the injured Avalin Cook. Squire had five points and four assists. Amber Naylor had three points; Cassidie Larsen and Keslee Cox had two each. Birch joined Amie Squire, LaRiah Rosser and Tyra Hermensen with one point each. Birch also had seven rebounds. Against the Hawks, Manti continued to struggle from the charity stripe, hitting only eight of 28. (See related story). This week the Lady Templars will be on the road to take on a couple of opponents. 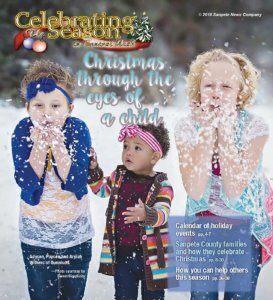 Today they will be at South Sevier. The Rams are 2-3 on the year with both their wins coming over Nevada schools. Saturday will see the Lady Templars playing in Duchesne. The Eagles are 1-5 on the year. RICHFIELD—After an impressive 53-48 overtime win at Juab last Thursday, Nov. 29, the Manti Templars varsity basketball team drew a pair of tough opponents in the 3A-2A Preview at the Sevier Valley Center. Manti came up short against Pine View on Friday, dropping that game 66-35 and then made a late-game run against Enterprise on Saturday, but still came up short, 80-72. At Juab, the Templars were sparked by six straight points by Dylan Wathen to overcome a 10-point deficit in the final quarter of regulation play. With two minutes left on the clock, Sam Benson banked in a three from the top of the key to tie the game at 43. Mac Stevens then hit a pair of free throws to give Manti the lead, but Juab matched those with a pair of free throws of their own to tie it at 45. The Templars had a couple of opportunities to win it in the final seconds, but couldn’t convert. Juab took the early lead in the overtime until Tanner Rasmussen drilled a three with 1:55 left to play to give Manti a 49-48 lead. With 20 seconds on the clock, Wathen stepped in front of a Juab pass for a steal and a layup. Brenton Thompson got a steal on the next Wasp possession, and Benson hit a pair of free throws to seal the victory. Stevens joined Corbin Linam with 10 points each. Rasmussen and Wathen had nine each; Benson added seven, and Thompson, Kole Brailsford, Matt Nelson and Riley Curtis had two each. Against Pine View, the Templars were outmatched from the get-go, trailing by four after the first quarter, 12 at the half, and 18 going into the fourth. Despite the loss, the young Templars had an opportunity to get most of the players involved. Wathen and Benson led the scoring with seven each; Rasmussen had six, Brailsford and Nelson had four each, Curtis had three and Thomson joined Stevens with two each. Saturday’s game against Enterprise saw the Templars get off to a slow start again. Trailing by 15 at the half, and by as many as 20 in the fourth quarter, the Templars showed their trademark tenacity and fought back, getting as close as five in the final minutes, but couldn’t catch the Wolves. The Templars had a balanced scoring game with four players in double figures. Stevens led the team with 14, Wathen and Rasmussen had 13 each and Curtis added 12, all from behind the three-point line. Linam had eight points; Kade Nicholes joined Nelson with five each and Thomson had two. This week the Templars were at Maeser Prep on yesterday (score unavailable) and will host North Sanpete tomorrow at 7 p.m.